One of the great novels of the 1930s, Such Is My Beloved recounts the tragic story of two down-and-out prostitutes and the young priest who aspires to redeem their lives. The novel is at once a compassionate portrait of innocence and idealism, and an emphatic condemnation of a society where the lines between good and evil are essentially blurred. 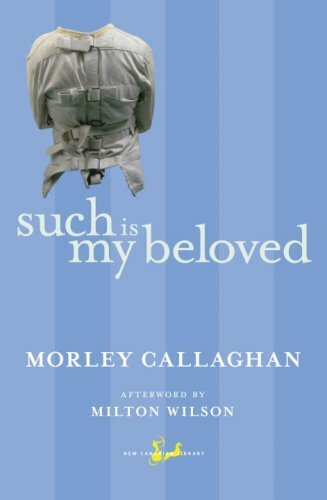 Such Is My Beloved is widely considered to be Morley Callaghan’s finest novel. Morley Callaghan’s literary circle included Hemingway, Fitzgerald, and Joyce. In a career spanning more than six decades, he published sixteen novels and more than one hundred works of short fiction. Father Dowling took off his hat and looked around slowly as if it were most important that he find a proper place to put it. He saw the room with the faded blue flowers on the wall-paper, the thick blue curtains on the window, the wide iron bed, painted white but chipped badly at the posts, and the copper-colored carpet that had a spot worn thin near the side of the bed. There were two chairs in the room. A door led into the next room. While he was looking around, the tall fair girl, who was wearing a loose blue dress that concealed the angularity of her body, assumed a ready smile, came over beside him and began to help him off with his coat with a dreadful efficiency. And the little, dark one with the round brown eyes and the smooth soft skin and a big bunch of black hair at the nape of her neck, jumped up from her chair with the same impressive efficiency, and in the affected manner of a great lady, extended her left hand with the elbow crooked as if he would be permitted just to touch the tips of her fingers. "How do you do, Sweetie. We are so mighty pleased to see you. You can't go wrong in coming here to see me." "Who said he was coming to you?" "He'll want to come to me. Won't you want to come to me?" "Take it easy, Midge. Don't be so pushing. He doesn't want you. Why, he first spoke to me. You heard him speak to me. Hell, though, if Rosy Cheeks wants you, it's all the same to me." "I'm not trying to rush him. Let him suit himself." As Father Dowling listened, all the words from the sermon of the old missionary priest that had been in his head were forgotten, and by this time Ronnie, the tall one, was pulling off his scarf. Holding the scarf in her hand, she stood still. She saw his Roman collar and knew he was a priest. They both looked scared for a moment, then Ronnie said, "For the love of God, Midge, look what the wind blew in." "He can't stay here. What are you going to do with him?" "I didn't bring him. Maybe the poor guy wants to stay." But Father Dowling had gained confidence in the one moment while the girls were abashed, so he waited to see what they would do. Starting to laugh, Ronnie said, "Don't get nervous, Father. It's all the same to us, you know," and her brisk, efficient manner returned, the grin settled on her face and she reached out in a hurry and took hold of his arm. Midge, who was slower to speak, had stepped back, frowning and timid; then she, too, grew bolder and she began to shake her shoulders till her full breasts swayed, and coming closer to him, she said, "Are you going for Ronnie, or do you want to leave it to me?"